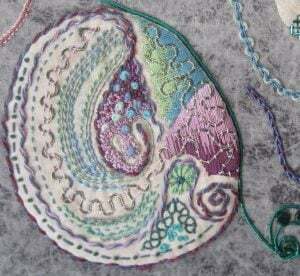 This lesson featured Cretan Stitch and Buttonhole Stitch. For me, these two stitches did not blend well together and, next time, I will combine Cretan with the other leaf stitches. Cretan is one of my all time favourite stitches. It can be so fluid and adaptable. Try listening to or singing the waltz ‘Die Fledermaus’ by Strauss to get the flowing and moving inspiration started. I have renamed this way of stitching it, the Cretan Waltz. 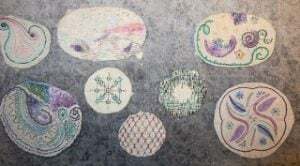 The pink and mauve areas are silk rovings needle felted in position while the more solid mauve/purple areas are dyed dryer sheet. The bits of gold and copper are chocolate wrap. Buttonhole Stitch is much more rigid. It can flow and move though I have not done that on this sampler. It does adapt well for couching. The coiled metallic cord is held in place with straight stitches. The third sampler in this edition is Cross Stitch with added beads. I used beads in small amounts here and there to add interest and some sparkle. The light mauve velvet background absorbed colour and did not give contrasts in texture or colour their due respect. 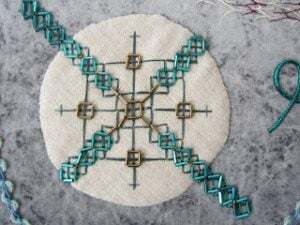 The next entry will feature Chain Stitch and Trellis Work. In the 1940’s, I inherited an antique embroidery frame. 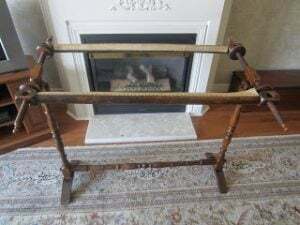 Probably made in the late 1700’s, the roller bars are 36″ long and the vertical posts are 32″ high. The frame will pivot on the hinge at the top of the vertical posts allowing the frame to be tilted to a comfortable angle for stitching. The fabric to be embroidered is stitched to the edge of the tape on the roller bars and then lashed to the side bars with string in the same manner as setting up a slate frame. 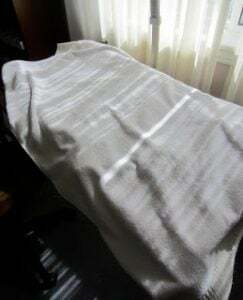 Although I have not used it very much, it has been used extensively in the past. This is evident as this is the third tape replacement. 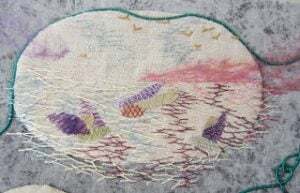 It was used to stitch English Country Garden and, currently, to assemble Creative use of Stitches. When embroidering on fabric mounted on a standing frame, a slate frame on trestles or using a stretcher bar frame supported by the edge of table, the following procedure is recommended to keep your embroidery both clean and undamaged during stitching. This is how the professionals do it. First, place clean white cotton fabric on the surface of your fabric for embroidery and roll both of them together around the roller bars. 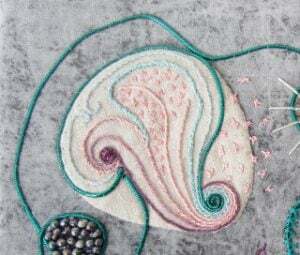 If your piece of embroidery is too wide for you to be able to reach the centre comfortably while stitching, this is how it is narrowed enough for it to be functional. You will have deduced that an unstitched section is rolled onto the rollers initially and that later, the completed part is rolled onto the other roller exposing the unstitched section. The completed portion in particular needs this protection. 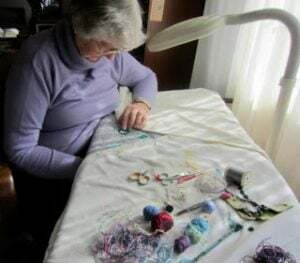 While actually stitching on embroidery mounted on a standing frame, a slate frame or a stretcher bar frame, I always protect both fabric and completed stitching in the following manner. Place one or more pieces of clean white or pastel coloured cotton or pillow cases over the fabric on the frame. The frame is light and I can hook my foot under the base bar and move it right or left thus repositioning the stitching for easy access. Or, when necessary, I can sit at the end of the frame. I use a height adjustable office chair with good back support. There is a delay in researching and writing about the student experience at RSN. RSN is trying to find for me some specific 1951 press photos and this may take some time. The story will continue as soon as possible.